I’m surprised that it’s midterm season already. 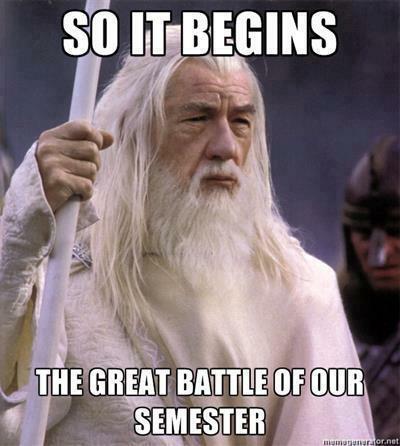 The semester is almost half way over! I should be happy about that but instead I’m internally crying and slightly panicking. Sometimes I want to rethink choosing a double major early this school year. All I can say is that I know that doing a double major will pay off somehow (I hope). Studying for English is definitely different than studying for Computer Science. One is very right brained, the other is left brained. I suppose that I have a good balance going on there, but it could be a bit difficult especially when you’ve had your head in a wonderful world of fiction and rainbows for hours and then you have to switch to math..and algorithms…and logic. But it is an interesting experience, double majoring. I have an opportunity to be in two realms at once, sitting with the chill thinkers of the age while also sitting with potential Mark Zuckerbergs. It’s also interesting to see the pain in the eyes of English majors as they glance at differential equations (in my Brit lit class, there’s a differential equation class right before us and the prof never erases the board before leaving), and the relief of Computer Science majors as they finish their one and only English class that they will ever have to take in their college career. It’s very funny to watch. As mid terms approach I am feeling a bit apprehensive, but I am not alone! I will conquer mid term week and I will make them revel in my greatness as A’s are printed out onto my papers. Jazmine here. I'm an undergrad college student trying to figure out what's going on in the world. I also happen to be an aspiring author of both adult and young adult books. I like video games, I like art. I like reading, I like rock music. My interests vary wide and far.